Yesterday I was talking with a dear friend of mine who happens to be LDS. ( born and raised, in fact!) She knows that I am born again in Christ and have resigned from the LDS faith. Fortunately, we have stayed very close. We love each other so much. I am blessed to call her my friend. Somewhere during our conversation the topic of prayer came up and I shared with her how very blessed I am to be able to be in a church that prays "collectively" or holds 'corporate' prayer. My friend didn't know what this meant, so I explained to her what it means to have a "prayer meeting" or to pray collectively as a body of believers. She thought it was really neat that the Church I attend sets aside time each Sunday for prayer, and also holds a prayer meeting weekly. "corporate" prayer involves praying together with others. The practice of praying together with other believers is a Biblical one and was practiced in the New Testament Church. One of the earliest accounts of corporate prayer took place in the "upper room". Both women and men had united in prayer and supplications. The Mother of our Lord was even present and praying as well. How beautiful a sight this must have been. Then there was the account of collectively praying when Peter & John were released from prison and they went "into their own company" and when their friends heard the great things that God had done for them, they " lifted up their voices to God with one accord and said: Lord thou art God, and hast made heaven and earth and sea and all that in them is..... and now Lord behold their treatings, and grant unto thy servants that they with all boldness they may speak thy word...... And when they had prayed, the place was shaken were they were assembled together and they were all filled with the Holy Ghost, and they spoke the word of God with boldness." What an awesome experience!! They lifted up their voices to God -- that is more than one person at that time raised their voices! That is various believers raised their voices with one accord ( at the same time) and the when they prayed the place was shaken & they were filled with the Spirit! Wow - now that is a prayer meeting! Wow! Our Lord said beautifully when He stated : " when two or more are gathered in my name, there I am also". 1. the pastor calls for prayer requests and he prays for them , while others listen and are in 'agreement' with him . 2. a prayer meeting is open to all who wish to offer up prayers - so various believers can pray one at a time ..... while others listen and then pray as well. I have experienced each one of these methods of praying as a "group" or collectively. Each Thursday night my Church hold prayer meeting. At the beginning the children are invited to pray.... we break up in small groups, children with parents. Each child is encouraged to offer up a prayer. We take turns praying. Then afterwards, the women have a time of praying together and then the men have a time to pray together. It is a precious experience! Not only do we get to lift up the burdens before the throne of grace, we come to truly taste of what "fellowship" is all about. It's simply wonderful to know that my brothers & sisters in Christ are praying for me, and lifting up my burdens before the Lord! It's also a blessing to be in prayer for others who may need it. The Lord knew that we needed one another - that is why he told us to not forsake the fellowship with other believers. We simply need each other! As I shared this with my LDS friend, she was touched by this. She admitted that there is no prayer meeting in the LDS church, and they do not take time to allow for prayers to be lifted up during their Sunday meetings. They do allow their members to add the names of those who need prayers to be added to the temple "prayer roll/list". And each day these requests are prayed over in the LDS temples, although there are no specific names or requests made in behalf of individuals. That is the closest the LDS get to collective or "corporate" prayer. As I mentioned in previous blog posts, prayer has become a precious blessing to me. Not only praying as an individual , but also praying with other believers. There is a fullness in joy when we pray. The sweet fellowship we experience with our Lord and with other believers unites our hearts and souls. This morning I re-read the account of Paul's conversion. It never ceases to amaze me "how" the Lord "chose" him and changed his heart in such a dramatic manner. Paul was truly not seeking a relationship with Jesus. In fact, he was travelling to Damascus on "business". His business was to collect Christians and have them bound. After Paul received his spiritual and physical eyesight..... he ate and "straightway" he preached Christ in the synagogues. He went first to those of his church.. the Jews. His heart was to first proclaim the message of grace & salvation to the Jews! For once I was blind and now I can see! I love the old hymn Amazing Grace -- it speaks volumes to my heart........ I also love the new rendition to that old hymn by Chris Tomlin -- Amazing Grace, My chains are gone..... beautiful. I also can relate to Paul's desire to go his friends in the Jewish Synagogue and share the good news of Christ! I too have that same desire to share the good news with those in the LDS faith. Paul spent years as a Jew.. I spent years as a Mormon....... Paul would often go to the Synagogue first when he stopped in his missionary journeys ........ he has a "soft spot" for the Jews and longed to share Christ with them. Many former LDS, including myself, also feel that "soft" spot for LDS to share the message of grace and salvation! That is why some of us have blogs or websites dedicated to sharing that GOOD news , and that is why some of us do continue to maintain ties with our loved ones in the LDS faith -- with hopes of sharing the news of our Lord with them! For my LDS readers, this is one of the primary reasons I began this blog ... that is for YOU. To share the news that Jesus , His blood shed on Calvary is enough to guarantee you eternal life in the kingdom of God. That is it's all about Him, and not about a "church"....it's about a personal and saving relationship with the Son of God. My heart's desire is to see many LDS come to taste of His goodness and that they too may have the scales removed and shed, and yes perhaps even have their own "Damascus" experience! That is my constant prayer for the LDS. Speaking of "praying" .... would you kindly pray for me while I travel across the country today . I am going back west to visit my parent's for their 60th wedding anniversary party. I am excited to see them and other loved ones, but also nervous to leave 10 kids behind with dad! I know he'll be ok, but my mama heart always gets a tad bit concerned. I know I know... I need to let go and let God. Please pray for safe travels, and for the kids and dad to just enjoy each other this weekend. Thanks so much, I 'll be back on Monday. So it's not too long of a trip. Some of my LDS friends have asked me "what" aspects of my life have changed since becoming a born again believer of the Lord. A few of my closest friends really wanted to know "what" could be better in my life now as a Christian vs. when I was LDS. I would have to honestly say that there are many areas that God has completed transformed in my life, since coming to a personal & saving relationship with Jesus -- but "if" I had to choose one area...... I would have to say the most drastic change that I have experienced has been in my prayer life. When I was a young child, my mom would pray with me each day before bed. We would recite the Lord's prayer each night before bed, and then she would tuck me in and kiss me goodnight. This gave me a great sense of security knowing not only my mom loved me, but " My Father" did too. As I grew older though, this traditional prayer was simply not enough to satisfy my longing to have a closer relationship with God. When I became LDS I learned how to pray a more spontaneous prayer, but formal with the formal language of "thee, thine and thou". This is what I call the King James language. I say that because the Hebrew and Greek languages ( the languages the bible was written in) do not have the formal "thee and thine". Even though as a LDS I did become more spontaneous in my prayers -- it still did not satisfy the longing I had to really fellowship with God. I so longed and looked for a more intimate and personal relationship with Him. In the last year of my time in the LDS church, I did begin to have some more personal prayers addressed to Jesus ( the LDS do not pray to Jesus, all their prayers are addressed to "heavenly father".) I noticed when I dropped the formality and focused on what I was expressing, then my prayers took a drastic change. They became more intimate. Now, as a Christian I can say that my prayers are radically different than when I was LDS and when I was a child!!!! Now, I can't wait to get up in the morning and spend time with my Lord in fellowship......... it's a precious time of day for me. Just me & my Lord. It's the first thing I think about when I get up in the morning. I could never do that as LDS!! I could never no matter how hard I tried, get myself out of bed to pray early in the morning! I was lucky to sneak in a few minutes sometime in the morning between getting breakfast for my family and getting babies cleaned up! Now I find that is not the case! I am so anxious to get up in the morning to be with the Lord -- it's something I just can't wait to do! The content of my prayers have changed dramatically as well. I no longer just focus on "my needs" but I have learned to love praying for others. It's such a blessing to sit and just pray for friends and family and even total strangers who may be sick, afflicted, needing encouragement, etc. I recently started a prayer journal to keep track of prayer requests, and answers too. I also love just taking time to give a prayer of thanks. I usually do these kinds of prayers at night before bed. I will just thank the Lord for everything......from food and good health, to the birds outside. I also find that during the day, the Lord beckons me to pray ........ if I am being led, I will grab a cup of coffee and head off to a quiet place and spend some time in prayer again. Another thing I notice is the Holy Spirit's leading in prayers. As I sit to pray, I always love to begin my prayer time in worship... singing a song of praise to the lord.... at that time the lord may impress a certain thing I need to pray for. It's amazing how the Spirit can lead in prayer. Not only has prayer become something absolutely precious -- I have seen huge changes in my children's prayer life!! They too have learned to pray from their heart. No longer the formal "we thank thee for food, clothes, we ask thee...." I am amazed at how intimate their prayers have become. They no longer need to fold their arms across their chests, as they did when they were LDS. LDS have a tradition of folding their arms across their chest . It supposed to help people maintain reverence..... and although I do believe one should be respectful when addressing our Lord, we certainly don't need to have our hands folded. Many times during prayer I will lift up my hands to heaven or just fold them simply on my lap.... there is no 'set way' of how we should keep our hands. The Lord truly cares about what is in our heart, not the formalities of "how" it's done. Thank you Lord! The kids love that freedom to express themselves as they feel led during prayer. I do ask that they maintain a worshipful attitude but they are not required to fold their arms, as when they were LDS. No more formalities. I also want to note that prayer is a huge huge part of the Christian's life. I realized this quickly when I became involved in our local church. I began to attend prayer meetings, and there is also a time set aside each Sunday at the beginning of service for prayer. My pastor has also called on us to have a time set aside at the end of Church to pray for the lost. Each Thursday night, the women in our church get together for prayer. The men do the same. We pray with the children of our church. Believers are a praying people -- that is what I have noticed. When I talk to a friend who is a believer, and they are having a hard time or are sick or in need of encouragement, we will pray. That maybe on the phone even! It's such a blessing!! When I was LDS I would never tell someone why don't we stop and pray and ask God for help... or healing or whatever the need may be........I would tell LDS friends that I would place their name on the temple prayer roll, but collective and corporate prayer is not a integral part of the LDS church. When a friend was sick, I would typically make them some bread and soup and drop it off and tell them I hope they feel better -- but ask to pray with them? No, that just wasn't a part of the way things are done. Now as a believer that is precisely the first thing Christians will think of doing! "I'll be in prayer for you" is often heard in Christian circles. What a blessing! What a wonderful thing it is to know that one is being lifted up in prayer thru the difficulties of life! 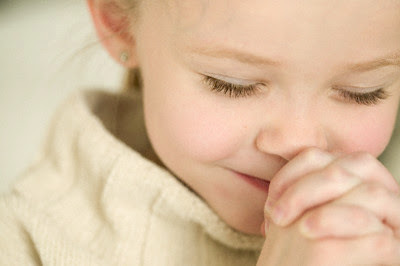 Prayer has become so precious, so sweet...... such a huge part of my life and the life of my children. I'll even find myself praying while I am on the ride mower mowing the grass, or when I am in the kitchen cooking, or in the car, etc. Praying without ceasing....... the Lord has taught me what that is and how very precious it is! I never realized how very precious prayer can become in the life of a believer. Thank you Lord, for lovingly teaching me what it truly means to pray. Thank you for capturing my heart, my mind and my life..... I so long to worship you...... you are my all in all. The years that followed my first prayer of salvation, were ones of gentle and gradual awakening. God proceeded to do an amazing work in my heart and life. He literally removed the scales from my eyes. Looking back now upon those years ( 2000-2007) I am absolutely amazed at how loving, compassionate and gentle my Lord was with me. He did not "pull me out of a burning building" but gently called me to HIM.... He truly is the good Shepherd and His sheep know His voice. As I mentioned in my last post, I was not "looking" to leave the LDS or to "find" another Church for that matter. For the most part I did what I was counseled to do.... I put my concerns about polygamy and the historical data surrounding this doctrine aside. I figured, God would "work it" out when and "if" I had to live it in the "next life". It's important to note that although the LDS mainstream church does not live a polygamous life style -- they do still indeed believe in this teaching and allow LDS men to be sealed to more than one wife, if his first wife is deceased, or has the man has been divorced. So, in "theology" the LDS church still believe that plural marriage is of "god" and will be practiced in heaven/the next life. I think most LDS don't give it too much thought though, because it isn't part of their culture or lifestyle anymore. I continued to attend my meetings, and serve faithfully in my "callings" in my ward. I "thought" things had been resolved about my concerns and doubts. I pressed forward and dove even deeper into the LDS faith. As much as I "wanted" to believe the LDS church was "the only true church", the Holy Spirit really began to work on my heart. In 2001, my husband and I chose to begin the process of adopting a child from Guatemala. I began to study about what the Bible said is "pure and undefiled religion". James 2:27 I realized God really had a heart for the orphans. I joined online support groups for families who were adopting . I "met"many families who really loved Jesus and who were also adopting. My heart wondered "why" the LDS church was not more actively involved in orphan ministry. I even went as far as to call the LDS church Social Services headquarters in SLC ( a LDS adoption placing agency that places babies of unwed mothers into LDS homes) and asked them what "the" church was doing with orphan work in the world. The response I received was shocking! I was told, ( very kindly, mind you) that there was no budget set aside for running orphanages or becoming involved in orphan work. I was stunned. It was obvious the LDS church has the financial resources to spend some of their tithing funds on orphans! The Bible speaks very clearly about the mandate to care for the orphans. I couldn't understand how the LDS church could spend millions on temples, and a conference center, and large church buildings, and money to run sports programs at their Universities and NO money to build orphanages? That stunned me. Other things were brought to my attention, that had never bothered me before..... For example each month the LDS hold a "fast and testimony" meeting. The first Sunday of the Month - LDS are asked to fast for at least 2 meals a day and give the proceeds of the money they would have spent on food to the go towards the care of the needy in their congregations. I realized the LDS do not use these funds to run "soup kitchens" or other food ministries to help feed the poor and hungry. It deeply troubled me that their large welfare program was used primarily by LDS and is not open for the local poor in the community. Why didn't they set up soup kitchens? Why not use the proceeds of fast and testimony to be used to feed ALL the poor and not just the LDS that were hungry? I didn't understand. Many churches are involved in outreach programs to feed the hungry locally. When my husband and I attended General Conference, we noticed how many beggars there were on the streets of Salt Lake City -- I also noticed that all the conference attenders walked right past these begging souls......... what was wrong, I wondered as my husband and I ran around to get some food to hand out to the homeless.....why doesn't the LDS church set up a soup kitchen and homeless shelter right here in the City right next to their conference center ? We went to eat lunch at the plush "roof top" restaurant at the top of the J.Smith memorial building -- we were amazed at how luxurious and ornate this building was. Marble floors, huge statues of Joseph Smith -- beautiful appointments........ while waiting for our table to become available we toured the top story of the building and noticed a lovely room set up with a beautiful buffet...... we asked the help there if someone was having a wedding reception -- no, we were told, "this is the luncheon for the general authorities". ( that is the LDS leaders). I became sick, and upset. Here there were homeless going hungry outside and these men are having a buffet? How can this be. My LDS readers reading this, may think I am being very judgemental.... and perhaps I am....... but I am merely sharing with you what was so deeply troubling to me. No money to build orphanage, no money to set up soup kitchens and homeless shelters.........but money to put on a lavish buffet for it's most prominent leaders? After lunch my husband and I checked out the chapel in the building where the locals meet.....including the President of the LDS church.... all I will say is goodness gracious........this is not some typical LDS chapel. I was amazingly appointed. Lavish is a word to describe it. It made me angry. Here LDS in latin america and other places hardly have shoes and food to eat and here their leaders were eating in style and worshipping in luxury. It hit me like a ton of bricks.... is this what our tithing money goes to? I was told it went to build temples....... not build memorials for Joseph Smith or to pay for lavish buffets for leaders. Something was wrong with this. Another ephinay happened when I sat in our Sunday Ward Sacrament meeting and the song: Praise To the Man Was Sung...... as I sat there singing a song I had sung more times than I can count thru the years.... I audibly heard in my ear the whisperings of the Lord speak very clearly: PRAISE NO MAN BUT ME. I can't describe the bolt I experienced. I was made dumb literally --- from that moment on I never sang that song again, and told my children to not sing it either. Praise to the man that communed with Jehovah. Death cannot conquer that hero again. I'll never ever forget that Sunday when so clearly I was commanded to speak NO more praises to the Mormon prophet Joseph Smith. Then there was the experience when I was sitting in a Sunday School class, and the teacher asked what the difference was between the LDS's teaching on grace and the Christian's view on grace and why. I remember raising my hand and quietly and yes even nervously saying " I believe I am saved by grace... I really do believe... and I don't believe it's grace after all you can do...... but by grace we are saved, not of works. "....... oh the clamor that arose! People started speaking out and saying how wrong I was and how it's not grace that saves us, but "grace after al we have done" grace after being baptized mormon and grace after we have gone to the temple and done the work for the dead..... grace "after". I knew at that point that I was deeply treading on new ground..... I knew that I knew that I knew that I NO longer believed the LDS gospel. Jesus had done a work, and I was beginning to see..... slowly the scales were starting to come off my eyes. One of the final moments of 'awakening' was when I was sitting in the LDS temple, and watching the endowment movie that portrays the fall of adam and eve and creation -- and hearing the man who portrays satan say " put on your aprons, see you are naked, go hide..." and the movie is stopped at that time and you hear the words "brothers and sisters put on your aprons"....... I was gripped with the knowledge at that moment that the apron was being commanded to be put on by satan! In the Genesis account of Adam and Eve, Adam and Eve sewed themselves fig leaves together and made themselves aprons to cover themselves. Gen. 3:7 But in the LDS temple, it was "satan" who told them to do so...... God made adam and eve, "coats of skin" ..... Gen 3:21 not fig leaves. As I look back now there were many many experiences and events I could share where the Lord was just opening my eyes and revealing truth and also falacies....... there are so many it would take too long to write them all, but these are some of the ones that stood out the most to me. The most amazing of all work the Lord did on me though, was thru the reading of the Bible. In the winter of 2005-2006 I began to read the Bible from cover to cover in it's entirety. I had read sections of it in the past, but not the entire book from Genesis to Revelation. It took me approximately 2 yrs to complete the study -- but let me tell as I read it God did an amazing work on my mind and heart..... I began to see very clearly that not only was the Bible not mistranslated as I had been taught as a LDS, but it was God's word! As I made my way thru the Old Testament, I read thru the Jewish Temple ritual and realized that the Jewish temple experience was nothing like what the LDS did in their temples, I also noticed how everything in the OT pointed towards Jesus -- the I AM. As I read thru the Book of John, the most amazing thing happened -- my eyes began to open and I read over and over again that it was a belief in Jesus as Messiah that saves and grants eternal life...... NO where in the Bible did it teach that one was saved "by obedience to the laws and ordinances" but by the grace of our Lord Jesus alone! I made my way thru the New Testament gospels and the writings of Paul....... and then to the end to the book of Revelations...... I realized the New Jerusalem - the City of God, will descend from Heaven and not in Jackson Co. Missouri! So many thing jumped out at me........ it was if Jesus himself was showing me "look at this gloria, and look at this........and finally....... that it was by His grace and His grace alone that I receive eternal life! Oh my! I can't recall the exact day I realized that NOTHING I could do - no good works, no temple ordinances, could grant me a place in eternity...... No nothing but the grace of our Lord.... it is not of "works lest I boast but a gift of God." Eph. 2: 8 & 9 Wow. What a huge burden was lifted off my shoulders. I didn't have to earn it........ I didn't have to endure to the end and hope that I did enough temple work, was faithful enough, etc to secure my eternal life....... No it had nothing to do with me! It had everything to do with HIM! At the time, I was teaching the women in Relief Society, and I gave my final lesson the last Sunday of November of 2007. I came home and told my husband I would not be returning again to the LDS church. 1 month later I emailed my bishop and told him I would not be returning again. I never looked back. I completely surrendered to Jesus........ I told Him I wanted Him and Him alone. That I was tired of religion, tired of "good works" and tired of failing miserably and that I was a sinner, and knew that I would never be "perfect" or "good enough".......... what a weight was lifted. I just prayed and asked Jesus to please show me the way.... that I wanted Him more than anything.... that I didn't want to err, but be right with Him. My husband was as you can imagine surprised. He didn't know really what to say. I had showed him the discrepancies in the Joseph Smith first vision, and initially this really troubled him. I won't lie and say it's been an easy road for him. We now have a interfaith marriage and family and that has posed some challenges, to say the least. But God in His grace is working on things and helping us to live a life of love and grace and forgiveness. In the next few months, we read thru the gospel of John. One by one the children gave their lives to Jesus......some sooner than others...... each of their experiences were unique and certainly a personal giving of their hearts to the King of Kings. Other than 2 of the younger ones, I wasn't even there when they were saved. From the beginning they were allowed to have the choice to remain LDS , or not. I fully expected my older kids to want to return to the LDS church -- after all it was all they had known. Given a chance to read the gospel of John and to hear the "good news" that Jesus is all they need - they chose Christ. Thru the past year or so, many of my children have shared with me how "burdened down'' they felt when they were LDS.... especially my teenage son , who was almost 15 yrs old when we left. He has expressed his relief with not having to have the pressure to be "perfect" and fall into the mold of the LDS man. At the time of his release he had been serving as his qurom president, and apparently he had felt a bit of pressure to lead, etc. I didn't even realize it until months after leaving and he opened up. I thank God each day my children were saved. God knew that they would be needed to encourage their mama down the challenging journey that lay ahead. They have been my greatest cheerleaders -- when things are hard, they are the first one to say " Go to Jesus, mom" or " remember don't let satan steal your joy"..... they are full of faith in the Lord and it blesses my heart so much! Initially we stayed away from any church in general. Our family needed a time to heal and to adjust to our new found faith . We were for obvious reasons feeling "burned out" on religion..... and really to this day, the name "religion" conjures up less than positive emotions and feelings. In the Spring of 2008 ( april) God began to lay in my heart a desire to fellowship with other believers. I was very concerned I would make a wrong choice again... so I really gave this step a huge amount of prayer and consideration....... I actually wrote a letter to God and wrote down all the things I was hoping to find in a church, and then left it in my Bible. It wasn't too long afterwards that the Lord led us to a small non denominational church in our small rural town here. I'll never forget talking to the pastor for the first time and inquiring about the church's beliefs -- he basically said that they are all about Jesus and non denominational, and that they preach the Bible, God's word and that is it. I remembering weeping....... just so hungry for God's word..... I was like an orphan child that had not eaten for months..... just so hungry I could not get enough of the Word....... My husband and I began to attend the bible study and then the prayer meeting....... each time I would go it was as if someone was feeding me for the first time....... I was literally eating it all up. I loved every second of it. I am so glad that God led us to a congregation of believers that truly are sold out for Jesus , and where the Bible is preached each Sunday and not a "sermon" and where the only creed is Jesus! We continue to worship with this body of believers, and we have been richly blessed! Thank you Lord! My husband did join us initially for Bible study and Sunday worship........but soon he chose to stop attending. We remain in prayer for his salvation, knowing God did begin a good work and will complete it. The work of salvation is truly the work of the Lord -- I am not called to be a "savior on mt. zion" ( an LDS saying) No, there is only ONE savior on Mt. Zion and that is Jesus! He is intimately involved in the work of salvation. My job is to love my husband, to serve him and to help him, but not to save Him. If Jesus wants him in the fold and in His kingdom, then it will happen in God's time, not mine. Meanwhile, we try to live a life of love one to another, although I will admit it can be challenging at times with our interfaith situation, but God is faithful to help us out each step of the way. I am learing to love and be the wife that God wants me to be ... not what I have been , but what He wants . So very different. The Lord is so patient with me and all my many screw ups a long the way. After we came to the Lord..... God continued to work in our lives...... in such amazing and wonderful ways! I can not even believe how awesome a God we have! He is so faithful -- so faithful. He has been our provider, our protector, our shield, our refuge, our all in all. 4 of my children and I were baptized in Christ Jesus in August of 2008. Prior to our baptism, I sent in my formal resignation letter to the LDS Church. I simply stated that I believed Jesus was the ONLY WAY and all I needed to receive eternal life and to please remove my name. It was completed in a timely manner, and less than 2 weeks later I received my letter stating my name was removed. I can not tell you how much of a burden was lifted at that moment as well... I literally felt as if the doors of a prison had been opened up and I ran out screaming "I am free" I am free! Praise God I am free! Free at Last! The baptism was a very simple service, focused completely on Jesus. Baptism for the christian is not about "joining a church" it's about publically confessing that we are the Lord's. For my LDS readers, Christians believe that Jesus commissioned his disciples in Matt 28 to go and teach and baptize. Our authorization to baptize comes from Jesus. Not from a priesthood. But, from Jesus directly. It was a beautiful experience...... soooo different than being baptized as an LDS. My pastor prayed with me, and then he had me pray and I publically confessed the Lord in my prayer. Then I was immersed in the water and then my children followed........ I am baptized not because it is necessary for salvation, but because the Lord has asked me to do so and so I do. I count it a blessing and privelege to have publically confessed that I am the Lords! His grace is amazing........and my chains are gone......... slowly, gently my Jesus wooed me , courted me and eventually guided me out of the LDS church and into the arms of His everlasting love. My exit out of mormonism, was a gradual process. I believe the Lord knew exactly what He needed to do for me individually. He did it ever so gently and lovingly..... showing me one step at a time, and opening my eyes to see the truth and also to see the lies. I love the story of the blind man being healed. It has taken on such personal meaning to me. It was the winter of 1999-2000 that I was presented the "good news". My husband, a general contractor specializing in remodels, was hired by two Christian couples to do extensive remodeling on their homes. My husband, being the faithful LDS that he is, wanted to have these couples over for dinner and share the "gospel" with them. We did end up having one of the couples over, and enjoyed a visit with them. They also homeschooled their children , so we enjoyed similar interests. I was later invited over to their home for a play date with the kids. At that time I was presented the good news. The obviously knew I was LDS and they gently shared with me the message of Jesus. I wasn't offended at all, but rather I pondered what she said. At that same time period, I had been called to teach R.S. and was going to be teaching about the the LDS prophets - in particular the teaching of Joseph Fielding Smith. A manual was given to me, and in my desire to learn more about this LDS leader and prophet, I purchased some biographies and also a video about his life. What I thought would help deepen my faith in LDS leaders created a dilemma! Joseph Fielding Smith practiced "plural marriage". That is polygamy. I was under the impression that this was lived in such a way: a man had to have the approval of his first wife in order to be married /sealed to another woman. As I watched the video on this man's life -- I soon realized that his first wife refused to share her husband with another wife, and as a result they divorced. Joseph Fielding Smith was committed to the principal of plural marriage and would not abdicate it's practice, even if his first wife disagreed. As I researched this out and studied what the LDS scriptures state about plural marriage, I read the following in the Doctrine & Covenants, a book of LDS scripture written by Joseph Smith. These saying were shocking to me! Why had I not noticed them before? Had I just skimmed over them before and just ignored them because plural marriage was no longer lived in the LDS church? Why hadn't I seen this before? I was deeply troubled that Joseph Fielding Smith had divorced his wife, simply because she would not accept a plural wife and that she would be "destroyed". I began to do more research on plural marriage and the LDS history of it's practices. What I uncovered was more disturbing than my heart could bear. I was told that these men married widows and women who were left destitute because of the trek west ... when I did research I found this not true. Also It stated in the D & C that men were only allowed to mary "virgins" but yet many LDS men took wives who had been already married, and some to faithful LDS men. They surely weren't "virgins" as outlined in the LDS scriptures. I also found that LDS leaders not always married within their "age range". Many of these men married women who could have been their daughter and in some cases their grand-daughters! You can do the research on www.familysearch.org and type in the genealogy of the LDS leaders and do the math and see for yourselves that these men did indeed marry women who had been already married, and some of them very young at that! At one point Smith taught that a man should have but "one" wife and then later he commands men to take another "virgin" ..... and if the wife does not agree she shall be destroyed?
" And sarai said unto Abram, behold now the Lord hath restrained me from bearing, it may be that I may obtain children by her, And abram *hearkened to the voice of Sarai. " God did not command Abram to take hagar! Sarai did -- big difference!!! At this point I was deeply disturbed. I shared my concerns with my husband and my bishop. Their response, was "don't worry about it" .. it's not a requirement for this earthly life........ this answer simply did not satisfy me. I decided it was time to hear what the Christians had to say about these things. I'll never forget knocking on the door of home of one of my husband's clients. "P" answered the door. She welcomed me into her home warmly. She was a seasoned believer, a daughter of Christian missionaries, who had spent years in the word and knew it well. I sat down with her and shared my concerns and feelings. She listened, did not judge, did not become angry, just listened. After I was done she asked me if I wanted to hear about Jesus. I said, yes I sure did, I have always wanted to know Jesus. She then proceeded to tell me the "good news" that Jesus died for me and that it is thru His grace I am saved and receive eternal life. I listened to what she had to say. She then encouraged me to pray and ask Jesus into my heart. I did just that. I went home and did the same. I really wanted to know Jesus. I have always wanted to know Him and follow Him. I came back home and prayed again and left it at that. I sincerely gave my life to Jesus. I didn't really know what to expect at this point. God did an AMAZING work on my heart and mind and soul! Looking back, I honestly believe I was saved in the winter of 2000. I just didn't realize it! Jesus had saved me, and He wasn't about to let me perish. I remained active in the LDS faith for 7 more years, but during that time period God lovingly and mercifully removed the scales from my eyes and healed me of my blindness. Easter has taken on new meaning for me and my children. It has become a precious & JOYous occasion. I know a number of my readers are LDS, so I thought I would share our weekend, and explain how Easter is celebrated in the Christian Church. First of all the entire focus on this prior week is on Jesus. Starting with Thursday night, our church fellowship met together for the breaking of bread , in memory of the last supper. We gathered together and sat around the table and parted bread and drank the fruit of the vine... children and parents.... the elderly, the young and the 'in between." :) There were friends there as well, who do not attend our particular church, but are believers and share in our common love & adoration of our Lord... thus they too are 'welcomed' to partake with us. The Lord's supper ( or communion as it is called in some churches) is for believers who have unabashedly given their lives to the King of Kings. Denomination is not a barrier for partaking at the table ...... this is a time we lay down our denominational titles and are unified in our common belief that Jesus is Lord and that eternal life is thru Jesus. It was beautiful and how proper that we should partake of the bread & wine ( or grape juice) on that day of all days. My pastor then read from the Word about the washing of feet, and how we should all have a servant's heart and wash the feet of others......we then spent the rest of the evening "washing feet" at the local nursing home. Our little church loves going and visiting the widows there. Usually we just pray with them, sing a few songs and just love on them. Many of them suffer from dementia and senility, so it can be heartbreaking. This last time we went, we met a precious woman named "Virginia". She is in her 90's and really very spry. She is there because Virginia has no living family and is unable to care for her home and farm. After we sang a few verses of Amazing Grace, I asked her if she "knew the Lord".. her response was so sweet: " Oh yes, I sure do! I'll never forget the day my husband and I knelt down at the altar and gave our lives to the lord at that revival"...... she wept when she recounted that event......... we prayed with virginia and asked the Lord to bless the last days and years of her life -- she longs to be "home" with her Lord. What a blessing it was to visit with Virginia. She blessed our heart so! Friday night, the youth were invited to view " The Passion". Sunday we enjoyed a lovely breakfast prepared by the men of our church, and then worship services. All I can say about this is OH MY! How wonderful it was to celebrate and rejoice in the fact that our Lord overcome sin and death for us! We clapped, we sang, we shouted Hallelujah -- oh how we rejoiced!!! I invited a few families who were LDS and they too so enjoyed the joyful service!! How precious it is to fellowship with others who also adore and love Jesus. We enjoyed a full morning, and didn't realize it was nearly 1 pm when we all piled into the car!! We had enjoyed a "full feast"..... not just physically with wonderful food, but spiritually! Oh my! I came home with the kids and we enjoyed an "egg hunt". Plastic eggs filled with little strips of scripture, about the resurrection. I made our traditional Resurrection cake -- a cake shaped as a cross, with " He is Risen" written on it. ( this year's cake was carrot and cream cheese frosting, yum!) We ended our evening singing praises to God and just feeling SO FULL of JOY! I know many Churches enjoy sunrise services and celebrations too. My friend that lives in New Zealand, enjoyed a lovely sunrise service on the beach! Can you imagine?!! Christians all over the world yesterday were praising God and shouting HALLELUJAH!!! I know many LDS may never have experienced a traditional Easter service, so I just wanted to give you a peek into what Easter may entail for many of us as believers. It is a time to reflect, to ponder our Lord's atonement at Calvary and a time to remember that HE DID OVERCOME death & Sin. Because our Lord paid the price for my sins -- I will live eternally with God, because the Lord overcome physical death -- I will too will be resurrected. I don't know about you all, but that is something work celebrating to me!!!!!! The greatest gift of all -- was given to us over 2000 yrs ago during the passover season.......Jesus truly is our passover Lamb. As believers we use the term " Easter" ..... doing a little research I found out that Easter means = passover in Latin. That is so cool! So it is an appropriate thing to say we celebrate Easter! Jesus our passover lamb, was given for us -- and He truly did overcome Sin & Death! Hallelujah! When I was LDS , I never recall experiencing the JOY of the Easter Season or the solemnity of Good Friday...... there were no special Good Friday Services held, no special "parting of bread" on Thursday, prior to Easter Sunday..... and no celebrating on Easter Sunday. Other than for a few Easter Hymns and a few talks given by members of the congregation - that was the extent of it. It was really "business as usual"... a Sunday like any other, but with a few Easter hymns sprinkled in. There was no celebrating. No Joy. I think back to all those years and realize how much I missed out on.... but at the same time I am all the more grateful for the JOY I have now in Christ. I feel sorry for my husband who didn't get to experience the worship and the celebration. My heart aches for my LDS friends and loved ones. I so long for them to partake of that feast the Lord offers us..... He IS living waters and He IS the bread of life -- He that drinketh of those waters and eats that bread shall never go hungry or thirsty. Now, I have that JOY ..... and it's is more than I ever imagined it to be! Wishing each of you a JOYOUS Easter!! Hallelujah our Lord is Risen!!!! 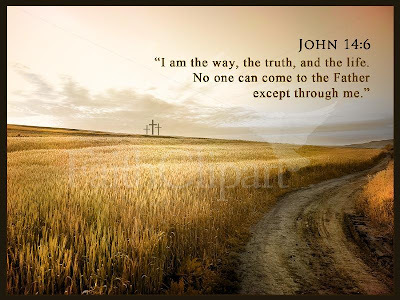 Jesus is the WAY.........the "way" is not a church, a religion, a denomination, a ritual, a membership, a good work........ Jesus is the WAY...... the ONLY way.... the only membership you need to enter into the Kingdom of Heaven is the name of Jesus in your heart, soul and mind.........don't believe me? And hoping beyond hope....... that you will be present at the wedding feast. Jesus, you are so worthy of our praise! You are beautiful to me! I arrived back to the United States after spending 18 mos in Argentina. My family was so relieved to have me home, and there was a big gathering "welcome home " for me when I arrived home. I have to hand it to my family, they really tried to reach out to me, even though they didn't agree with my choices I was making. They just loved me. God bless them. Upon arriving home, I promptly told my mom about my "head lice problem"..... yikes! Bless my mom she spent the first full day I was home tackling my hair! Fortunately those little critters were gone for good! I arrived home just a few days before Thanksgiving, so the whole family got together for good times and good food! I was to "report" on my mission the first Sunday after I arrived home. That is a "homecoming" was in order. The LDS don't do homecomings and farewells anymore.. it's too bad, because it is really a nice gesture for the out going missionary or returning missionary. Basically a "homecoming" means a entire "sacrament meeting" ( the main Sunday meeting) was dedicated to letting the newly returned missionary share experiences and stories from their mission. I really enjoyed listening to these talks, but sadly they really don't do this anymore. Now, the LDS return missionaries are given a "topic" to talk about, instead of allowing them to share what they wish to. :( I don't recall much of what I shared about my missionary experiences, but I do remember the warm embraces and hugs from those in my "home" ward. I do remember my parents coming out, and that was always a blessing to see them try to support me in something they themselves didn't really agree with. They did it out of love. I was asked by a high councilman ( an LDS man who serves in a calling to oversee the affairs of an LDS congregation or "ward" and then reports back to the"stake") to speak at a local single's ward. I showed up early and made sure my notes were in order. As I spoke I noticed a man slip in to the chapel a bit late. He later introduced himself to me after the meeting. The rest is history. We were married in the Seattle LDS temple 3mos after our first date. It is typical in the LDS church to encourage short courtships. It is most definitely not a doctrine or "rule" but just an unspoken expected. There are exceptions to this, most LDS couples I know had short courtships. The LDS church teaches sexual purity to it's unmarried, so this may be a reason that they encourage speedy courtships. Overall, LDS marry young and they don't wait once they know "who" they are to marry to get married. :) Hope that makes sense. In any case, our "quick"courtship flipped my parents out -- especially my dad! They had been so patient with so much, but this was too much for them. My father was especially upset and really concerned that we did not know each other well enough to make a decision to get married. Our minds were made up, and we moved forward . Our Temple sealing, was attended by LDS friends, but neither of our parents attended the ceremony. My parents were not members and my husband's parents were not active in the LDS church and did not have a temple recommend. It was a beautiful June day -- the weather was gorgeous...... looking back I can only imagine how my non LDS parents and sisters and family felt..... they didn't say anything....... but quietly waited outside the temple for us to come out. If I was to do it again, I would have married in an LDS chapel and then waited to be sealed. It hurt my parents deeply, and rightfully so. We enjoyed a typical LDS reception , held at the local meetinghouse "cultural hall" which also doubles as a gym complete with basketball hoops! :) Both of our families did the best they could with supporting us thru this time, even though they may not have understood "why" we were doing it the way we were. There was hurt feelings, but they sure tried hard not to show them. My husband had also completed a full time mission, and had been waiting for sometime to "meet" his eternal companion. The LDS believe very deeply in the teaching that "families are forever"...... that is they believe that it is only in the Temple, where a faithful LDS couple should marry, and receive the ordinance of eternal marriage. They believe marriage done in this way will ensure, if the couple is faithful to the LDS gospel, an "eternal" marriage... that means the husband and wife will be married in the next life as well as this one. The ceremony is a simple one. The groom and bride kneel down by an altar and hold each other's hand in a special grip that is considered "sacred" and not to be revealed. It's similar to a boyscout grip, if you know what that is. In any case, the couple kneels down, grip each other's hand, and then the "temple sealer" the LDS man who officiates, then "seals" them for time and all eternity. It is a very simple ceremony and very short. Maybe 5 minutes long or so? In any case there is no exchange of vows, no rings exchanged. Only LDS with temple recommends can attend the temple sealing. If a family member is not LDS or is not able to secure the necessary recommend they will not be able to attend the sealing/wedding. Each pregnancy was increasingly more difficult.... and after one c-section after another c-section I was left depleted and unhealthy. Cronic morning sickness for 9 mos with each child was really taking a toll. Close family took me aside and questioned my desire to have more children. They asked whether I was pressured to do so by my church. I would tell them "no", of course not, and really none of our church leaders ever said anything to us, but what I didn't tell them is my husband and I were studying about what the "prophets" said about children and family planning. My husband and I became convinced that birth control was not of God and that we needed to allow god to send down as many "spirit children" as He wanted. This whole concept of "spirit children" is an LDS teaching that teaches that God lives on his own planet and with "heavenly mother" ( s) ( God's wife) bears "spirit children". These spirit children do not have bodies but "spirits". They must be born on earth to have a "body" and the are assigned to a particular home or "choose" to go to a certain home/family. It was encouraged for many years for LDS women to have many children and to bring down as many "spirit children" as they possibly can. LDS women play a vital role in this "plan" because they bear the "spirit children" of God, and thus it is a blessing for them to have as many spirit children come to their home, instead of the home of "non LDS". I know this may sound really "odd" to non LDS reading, but I am trying to explain things as simply as I can. I explain this because , this teaching affected my husband and I, and our decision to have many children. I did a good job "hiding" my feelings. My husband knew I was tired and exhausted, but no one else did. I hid that from my friends at church and my extended family. 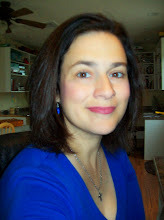 My husband's business had flourished and blossomed and were financially doing very well. We had a lovely home, and 4 beautiful children..... and from the outside it appeared as if "all was well". But in my heart of hearts, I was so tired....... and definitely not feeling the JOY I was promised to have. And that is what I will be sharing with you in my next blog post. Good morning! I hope & pray that you are enjoying a blessed week as we look towards the Cross of Calvary and the empty tomb on resurrection Sunday! I just wanted to take a moment and tell my readers how much I appreciate their comments. I read each comment you leave, and I generally will publish them as soon as time permits. With that said, I welcome your "courteous" comments. :) That is even if you disagree with what I am sharing here, you are welcome to disagree ( thank God we live in a nation where we have freedom to do so!) . I have no problem with a person disagreeing, but I will not publish comments that are rude, or discourteous. Inflammatory remarks about my person, or husband or family or friends will not be tolerated. Period. I want you all to know that I pray each day over this blog and ask God to guide my words. I may make mistakes along the way, chances are I will stumble. It is not my intent to attack the individual members of the LDS faith, but merely to share my experiences while I was a member and to present the good news of Christ Jesus and how it compares to the LDS gospel. I will strive to do my best to remain courteous and sensitive in my posts here as I share about sensitive doctrines and teachings that are controversial . With that said, I will not "hide" things. That in itself may irritate some LDS readers. It is my greatest hope and desire that the Lord use this blog for His glory! My heart yearns to see the LDS embrace Jesus -- the Messiah - the I AM -- and I will continue to write and share what the Lord impresses upon my heart. I also pray that this blog will equip the body of Christ to better understand their LDS neighbors and friends so that they may be able to reach them for Christ. Jesus, was hated , despised, spat upon and reviled because He preached that salvation was not about a religion, a ritual or a "membership" into the Jewish faith....... He preached that HE IS THE WAY and He preached that it is only thru a personal relationship with Him that we may receive the blessing of eternal life. This week marks the anniversary of the SINGLE MOST important event of all the earth's history........ the week we remember the suffering of the Lamb of God -- which takes away the sins of the world. 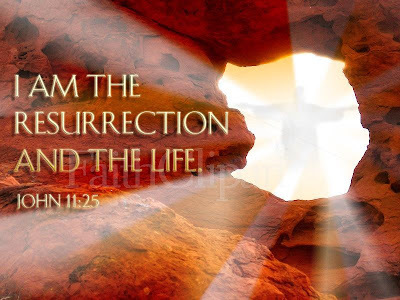 John 1:29 and His glorious resurection!! It is the week we remember the blood that was shed on the cross of Calvary. Jesus made "peace" through the blood of His Cross. It is thru the blood of the Lamb that we are justified, forgiven and cleansed from our sins.
" we have been made right with God by the blood of Christ's death"
The *single* greatest act of sacrifice ever completed in the history of humankind was completed by our Lord, the Lamb of God on Calvary 2,000 yrs ago. When I was a young child growing up in the Roman Catholic Church, I was taken to mass daily during Holy Week. My mother would take me thru the stations of the cross. The stations of the cross are pictures/drawings of the last week of the life of our Lord. I recall seeing my mom shed tears and she recounted to me what our Lord did. Those memories are deeply embedded into my heart. When I became involved with the LDS Church, I immediately noticed that the LDS do not place focus on the Cross. In fact, if you go to their chapels ( which are open to the public) you would notice that there are no crosses either on the inside or outside. The same is for their temples. The LDS believe they are to focus on the "risen" Christ not the crucified Christ. Well, Yes, Jesus is risen! Hallelujah! That is why most Christian churches have an empty cross adorning their steeples or inside their buildings. LDS members do not wear cross necklaces and their homes do not have crosses on their walls. As a missionary , I was instructed to encourage new converts to remove the cross from their walls and to not wear any jewelry with the cross on it. For those that are not LDS, you may ask yourselves "why"? "If" the LDS claim to be a "christian" church, why do they not use the cross as a symbol of their faith? The answer lies in the fact that the LDS church does not teach that it was on the cross that Jesus paid the ultimate sin offering. No, the LDS officially teach it was in the garden of Gethsemane that Jesus atoned or paid the price for our sins. The art print above, is a popular print that can be seen in the chapels and temples of the Latter - day Saints. It represents Jesus in the garden of Gethsemane. The LDS officially teach it was there that Jesus bled for our sins. This print can be purchased in a set with other LDS artwork. It can be used by families to teach the LDS gospel in their homes. On the back of this art print is stated the following: " In the garden of Gethsemane, Jesus suffered for our sins. Jesus prayed more earnestly and He sweat great drops of blood as He atoned for our sins." You can purchase this art kit or print from the LDS Church distribution center. The art print below is from "New Testament Stories,pg. 111" a book for Children published by the LDS Church. This pciture depicts Jesus in the garden, "bleeding" for our sins....... Here is the caption printed below this picture: " Jesus was praying. He was sad. He began to shake. Blood came out of his skin. All his body hurt. It hurt because he was suffering for the sins of all the people. While Jesus suffered and prayed and angel came to make him stronger. Jesus finished praying. He had bled and suffered for the sins of all the people." 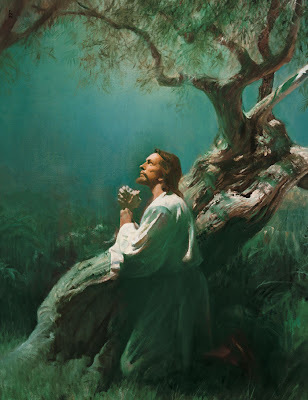 " Which suffering caused myself, even God the greatest of all to tremble because of pain, and to bleed at every pore, and to suffer both body and spirit and would that I might not drink the bitter cup and shrink --- "
The LDS Church teaches that Jesus "bled" at Gethsemane and there suffered and took upon himself all of the sins of mankind. Aside from their teaching from Joseph Smith, they use a verse from the book of Luke and make a "twist " to it's meaning. What does the bible teach about his garden experience and his sweat ? This verse from the gospel of Luke clearly states that Jesus prayed earnestly and " his sweat" was as it were great drops of blood. I like to compare the various translations..... they all state that his sweat "was like" drops of blood, not literally drops of blood. Big difference. When comparing the account of Luke to Matthew and Mark's account, Luke is the only one that gives this description of sweating at all. "If" Jesus had truly suffered for all the sins of mankind in Gethsemane, shouldn't the bible state that? I will share later that indeed the Bible teaches it was the CROSS where Jesus paid the price and by his blood on the cross, not gethsemane ( there was no blood shed there) we are forgiven. The bible does not teach that the atonement was made in Gethsemane. It does not teach that jesus paid the price for our sins there. If so, Paul and others would have been preaching " gethsemane not Calvary"! Thus, the Mormon teaching of Jesus bleeding for our sins in Gethsemane is born! He changed the verse from saying that "he sweat as if it was blood to he sweat blood". Wow. Now, you understand "why" the LDS do not revere the cross of our Lord, but rather the garden of Gethsemane was the place where Jesus atoned. Thus, the lack of crosses in their buildings and temples and in the homes of their members. If pressured, the LDS will tell you that the cross was a painful death and surely not to be spurred at, but clearly and resoundly they preach Gethsemane and not Calvary. Now, that you know what the LDS teach about "where" our Lord atoned, let's take a peek at what the Bible declares about the Cross. 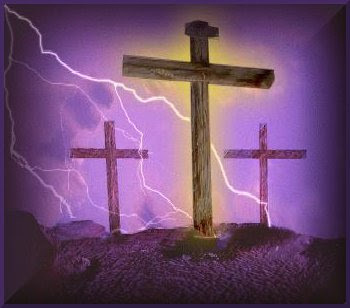 It is very important dear readers to understand that Jesus had to have died on Calvary. His death and the events leading up to his death on the cross were prophesied years prior. Here are a list of prophecies made about the events in the final days of his life that were fulfilled and finished on Calvary. Psalm 41:9 yea, mine own familiar friend, in whom I trusted which did eat of my bread, hath lifted his heal against me. Fulfilled: Luke 22:47, 48 And while he yet spoke behold a multitude and he that was called Judas, one of the twelve went before them, and drew near unto Jesus to kiss him. But Jesus said unto him, Judas, betrayest thou the son of man? Zech 11:3: And I said unto them, If ye think good, give me my price, and if not forebear. So they weighed out for my price 30 pieces of silver. Fulfilled: Matt 26:14,15: Then one of the twelve, called Judas Iscariot, went unto the chief priests and said unto them, What will ye give me and I will deliver him unto you? And they covenanted with him for 30 pieces of silver. Ps 35:11: False Witnesses did rise up, they laid it to my charge thing I knew not. And there arose certain and bear false witness against him saying, We hear him say I will destroy this temple that is made with hands and within three days I will build up another made without hands. He was oppressed and he was afflicted, yet he opened not his mouth, he is brought as a lamb to the slaughter and as a sheep before her shearers is dumb, so he openeth not his mouth. And Pilate asked him again, saying: Answerest thou nothing? Behold how many things they witness against thee. But Jesus answered him nothing so that pilate marvelled. I gave my back to the smiters and my cheeks to them that plucked off their hair, I hid not my face from shame and spitting. They did spit upon his face and buffeted him, and others smote him with the palms of their hands. Be he was wounded for our transgression, he was bruised for our iniquities the chastisement o our peace was upon him and with his stripes we are healed. For when we were without strength, in due time Christ died for the ungodly. But God commendeth his love towards us, in that while we were yet sinners Christ died for us. Therefore I will divide him a portion with the great, and he divide the spoil with the strong, because he hath poured out his soul unto death and he was numbered with the transgressors and he bare the sin of many and made intercession for the transgressions. And with him they crucify two thieves ,the one on his right hand and the other on his left hand, and the scripture was fulfilled and he was numbered with the transgressors. And I will pour upon the house of David, and upon the inhabitants of Jerusalem the spirit of grace and supplications and they shall look upon me whom they have pierced and they shall mourn for him as one mourneth for his only son and shall be in bitterness for him, as one that is in bitterness for his first-born. Then saith he to Thomas: Reach hither thy finger and behold my hands and reach hither they hand thrust it into my side and be not faithless but believing. All they that see me laugh me to scorn, they shoot out the lip they shake their head saying: He trusted on the Lord that he would deliver him seeing he delighted in him. And the people stood beholding. And the rulers also with them derided him saying: He saved others, let him save himself, if he be Christ, the chosen of God. I may tell all my bones; they look and stare upon me. They part my garments among them and cast lots upon my vestures. And they crucified him and parted his garments casting lots that it might be fulfilled which was spoken by the prophet. My God, My God why hast thou forsaken me? Why are thou so far from helping me and from my words roaring? And about the ninth hour Jesus cried, with a loud voice, saying " Eli, Eli, lama sabachtani? That is to say, My God , My God why hast thou forsaken me? He keepeth all his bones, not one of them is broken. And when they came to Jesus, and saw that he was dead already they brake not his legs. But one of the soldiers with a spear pierced his side and for with came out blood and water. All of these prophecies have been fulfilled. Jesus had to be sold for 30 pieces and betrayed by Judas, He had to be spit upon and scourged and crucified and pierced! All of these were prophecies that were to be fulfilled in the final hours of his life on earth! Furthermore the writers of the Bible preached the Cross. 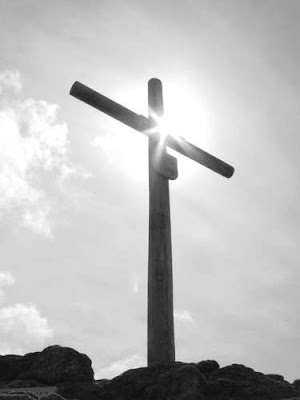 What is the cross? SALVATION. To those that are perishing spiritually it is "foolishness". But oh to us, as believers, it is Salvation -- for on the cross our blessed Lord paid the final price for our sins -- it was there that Lamb of God completed the work -- it is there that IT WAS FINISHED. Jesus shed blood on the cross is what saves us! There was no blood shed in the garden. The blood had to be shed, and that blood was shed when Jesus was crucified and pierced.
" The cross of our Lord Jesus Christ is my only reason for bragging." "But God forbid I should glory, save in the cross of our Lord Jesus Christ." " May I never boast except in the cross of our Lord Jesus Christ. " As believers, we are reconciled and made right with God thru the Cross! Paul warned us of the "enemies" of the cross of Christ. Phil 3:18. I do not believe in any way that the LDS are enemies to the cross. I believe they are sincere in their beliefs. But, my dear friends "sincerity" does not equate truth. As sincere as they may be about their beliefs about Jesus atonement in the garden, it just simply is not the truth. I know Jesus' atoned for us on the cross. I know His blood was shed for me on the cross, so that I may have "peace" with God and live with Him forever. I boast of one thing and that is the cross of Jesus! Yes, I can brag about that ... I can brag about what my Jesus did for us all on that cross so long ago. Yes, that 'old rugged Cross of my Lord! Responding to a comment about "worship"